WASHINGTON, DC, August 30, 2010 (ENS) – With battery electric cars, plug-in hybrids and regular hybrids joining gas-powered cars and light trucks in the marketplace, the Obama administration today proposed updated fuel economy labels to be pasted to the window of every new vehicle in dealer showrooms. The U.S. Department of Transportation and the U.S. Environmental Protection Agency are seeking public comment on two new designs for the window stickers that are intended to give buyers simple, straightforward energy and environmental comparisons across all types of vehicles beginning in model year 2012. The current labels now give information on miles per gallon and annual fuel costs. The EPA has provided fuel economy estimates in city and highway miles per gallon values for more than 30 years. 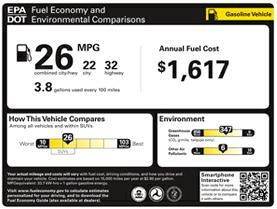 One of the new label designs keeps the current focus on miles per gallon and annual fuel costs, while updating the overall design and adding required new comparison information on fuel economy and emissions. The other new label design features a letter grade to communicate the vehicle’s overall fuel economy and greenhouse gas emissions performance. This design would provide consumers with an estimate of the expected fuel cost savings over five years compared to an average gasoline-powered vehicle of the same model year. Both proposed label designs expand on the content of the current label by including new information on fuel consumption, tailpipe carbon dioxide (CO2) emissions and smog-related emissions. The new labels would provide information on a new web-based interactive tool, accessible by smart phone, that would allow consumers to personalize the information about a vehicle’s performance. For electric vehicles, EVs and plug-in electric vehicles, PHEVs, the agencies are proposing to show energy use by translating electricity consumption into miles per gallon equivalent. The proposed label designs for EVs also include energy use expressed in terms of kilowatt-hours per 100 miles. The agencies are proposing that the label only present information on vehicle tailpipe emissions. Upstream emissions, which are associated with electricity generation or refining of fuel, would not be displayed on the label. The agencies propose to develop a website that offers more information on non-tailpipe emissions, while taking comment on other approaches to provide consumer information about lifecycle emissions across various vehicle fuels and technologies. Click here to find out more. A 60-day public comment period that begins with the proposal’s publication in the Federal Register. All comments should be identified by Docket ID No. EPA-HQ-OAR-2009-0865 and submitted on the Internet at: http://www.regulations.gov or by email at: newlabels@epa.gov.